Workers Uniting sent a letter to Colombian Ambassador Néstor Osorio Londoño to express major concern at the murders of two members of FENSUAGRO, our sister trade union in Colombia. Click here to read the letter. The United Steelworkers and UNITE the Union congratulate Napoleón Gómez Urrutia, President and General Secretary of Los Mineros of Mexico, on his nomination by the MORENA party as a candidate for the Mexican Senate in the July 1, 2018 elections. Workers Uniting has serious concerns about efforts by several hedge funds to oust the CEO of Arconic, the specialized metals and components company formed in late 2016 after the breakup of Alcoa, Inc. Read more here. Workers Uniting brings together Unite, the biggest union in the UK and Ireland, with the United Steelworkers, the largest industrial union in North America. Here are four reasons why this partnership is critical. The economy is globalizing. From Brussels to Beijing, decisions about our economy are increasingly made far from home. 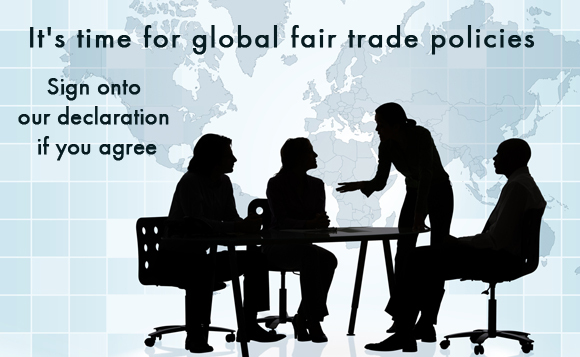 A global union can provide us a voice in those decisions. Politics is globalizing. Right wing politicians are using the same vicious tactics to undermine our livelihoods in the UK as they are in the U.S. and Canada. A global union can help us support progressive politics on both sides of the Atlantic. Our employers are globalizing. A couple decades ago, only a few of our employers operated in more than one country. Now, nearly all of them do. A global union can help us stand up to our employers wherever they operate. The movement is globalizing. Whether it’s standing up for fair trade or fighting back against bank bailouts, progressive groups are mobilizing and uniting everywhere. A global union can helps us join them in the fight for a better world.